This is a great opportunity to spend time outdoors and earn some extra funds for the summer –great people, great food, and an inspiring time! Our Health Care Coordinator checks in students! Application Deadline: Applications will be reviewed as they are received. 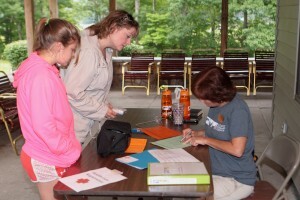 Position Description: The Health Care Coordinator/Camp Nurse serves as the primary person in charge of health care, dispensation of medications and medical history review of all participants (adults and youth) during the Wildlife Leadership Academy residential field school. The Academy trains high school youth in a curriculum emphasizing wildlife/fisheries biology, habitat, and ecosystem management in Pennsylvania. Students learn through hands-on field studies combined with classroom activities and labs taught by leading wildlife biologists and professionals from throughout the state. Must be a physician, RN, EMT, EMS, or CRNP and be able to provide appropriate licensing/certification documents. Ability to originate, update, and/or monitor health care, maintain records, and implement the health care plan. Must be able to deal with emergencies. Desire to work and live at a residential field school. Experience working with youth, such as a school nurse, desirable. Must complete necessary clearance and background checks in alignment with our Child Protection Policy. Be on-site at the field location at all times (day and night). Attend any off-site field trips with the youth. Room and board will be provided. Be present at registration to check the Health History form of each participant (youth and adult). Review Health History forms with parents and adult participants (team leaders) during registration and discuss any health conditions that require special treatment. Meet with the team leaders to discuss health issues, physical limitations, allergies, medication schedules, etc., among members in their team. Keep all drugs and medications under lock and key. Administer medications as prescribed. Monitor the health status of participants (youth and adults) and staff during the week. Administer first aid and treat minor injuries and illnesses. Communicate health status of participants and staff to the Program Coordinator, alert Coordinator of all injuries and illness and recommended treatment. Ability to communicate and work with participating groups. Visual and auditory ability to identify and respond to emergencies. Ability to use the telephone. Ability to drive to doctor or emergency treatment locations. Ability to lift and assist students or staff. Ability to read prescriptions and health exams from physicians. Ability to observe and assess any unsanitary or unhealthy conditions of facilities. Click here to begin the Health Care Coordinator application today.